If your pressure washer turns on, but won't pressurize water, don't give up on it just yet; it's likely that the pump has gone bad. If you invested in a professional pressure washer with an axial cam or triplex plunger pump, replacing the pump can be much more affordable than having to replace the entire pressure washer. And, it's easier to replace a pump than you think (how-to guide linked at the end). On the flip side, most entry-level pressure washers have wobble pumps, which are not replaceable, and in those cases, you're better off buying a whole new unit. Read below to learn how to tell what type of pump you have, how to select a replacement, and how to install your new pump. What Type of Pump Do I Have? 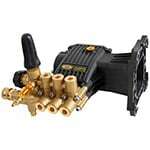 First, you'll need to make sure the replacement pump you're buying will be compatible with your current machine. To do this, you'll need to know if the existing pressure washer pump is axial or triplex. To determine this, look at how your pump attaches to the motor. If the driveshaft of the motor points directly at the brass valves, it's an axial cam pump, which means that the driveshaft is directly spinning the cylinders that pressurize the water. If the driveshaft runs parallel to the brass valves, it's a triplex pump, which means that the driveshaft is powering a crankshaft that, in turn, moves plunger rods that pressurize the water. Next, determine the shaft diameter-size and determine if it's solid or hollow. Look at how the flange on your current pump attaches to the motor, and measure the bolt pattern. You want to be sure the new pump will install as-is. 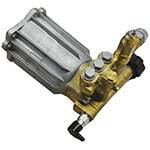 Also, determine if your existing motor is horizontal or vertically shafted—Does your pump mount next to the engine (connected to a horizontal driveshaft) or underneath (connected to a vertical driveshaft)? You'll have to match your old pump's pressure rating (PSI) and gallons per minute (GPM) with those of an available replacement. Remember, more is not always better—getting a new pump that puts out a lot more PSI can either bog down the engine, or be too powerful for your hose's burst rating. Check out the installation drawings and owner's manual for the replacement pumps that are similar to your current pump, and compare the measurements to make sure your new pump will fit properly. Typically, all major engine manufacturers produce the mounting flanges with the same measurements and specs. However, it's highly suggested to double-check your measurements before you order; there is a 25% restocking fee on returned pumps. If you have any doubts—Give us a call today, before you buy. Now that you've found the perfect replacement pump, it's time to install it and get back to washing. 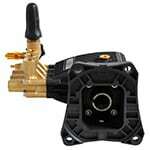 It's easier than you think to replace a pressure washer pump. Just follow our guide linked below, and you'll learn how to replace your pump in a matter of minutes!